When I first started having trouble with anxiety and worry and stress, I always found it impossible to relax. I couldn’t think of anything that might help me and I started to believe I’d just forgotten how to do it and that was that. In time, though, I started trying different things and I figured out the best things for me to do if I’m feeling anxious or worried. This list is just a few suggestions for those of you who aren’t sure what to do. Try some, leave some, but I hope it might help in some way. Maybe this seems like an obvious suggestion, or maybe not. There’s stuff about mindfulness everywhere these days and I see that as a really good thing. Personally, it has helped me a lot in learning to deal with stress and anxieties and in general it’s a useful tool to have in everyday life. If you want to give it a go, I recommend the Headspace app (also on desktop) as a good place to start. To start off there are 10 lessons, 10 minutes long each, that guide you through a mindfulness meditation to help clear your head. If you like it, then after the 10 days, you can subscribe for more. Edit: while I definitely think Headspace is a great place to start as an introduction to mindfulness, some people might feel it’s a bit too expensive to subscribe after their 10 free lessons. There are other apps available that provide guided meditations – I use Insight Timer. In some ways the benefits of doing yoga are similar to those of practicing mindfulness (and yoga incorporates aspects of mindfulness), except yoga is also a way to exercise and stretch out all the tension that builds up in your muscles from all the stress throughout the day. I find if I’m having a particularly bad time, my body feels it as well as my mind, so yoga is great for addressing that. I always thought that yoga wouldn’t be for me because I figured I didn’t have the patience or the flexibility, but I’m so glad I decided to give it a try because I think it has made a huge difference for me. I started off with a class in college and I would say it’s best to start out by going to a class where a teacher can help you out if you’re having any difficulties. I started also practicing at home using the YouTube channel YogaWithAdriene. My favourite videos are the Bedtime Yoga Sequence and Yoga for Anxiety and Stress, and I’ve recently started working my way through her 30 Days of Yoga series. Even if you don’t have a mat yet, you can start off with this 5 minute video for stress! 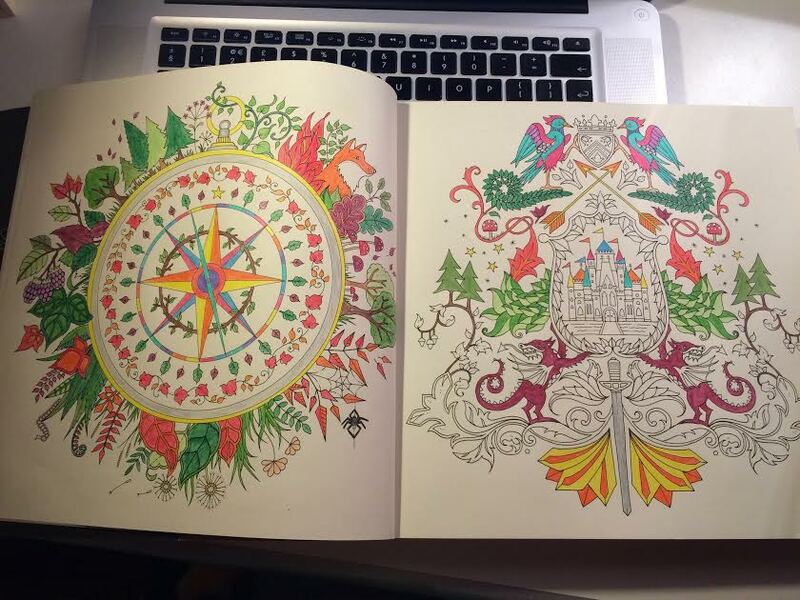 When the adult colouring books came out I sort of dismissed them at first, again using the excuse of not having the patience for something like that. However, as time went on, and I was looking for new ways to occupy my time so that I wouldn’t be focusing on my worries so much, I realised that a colouring book could actually be what I was looking for. It also gives me the opportunity to be creative which always makes me feel better. It’s not something that takes much time out of your day either really, because you can just sit and colour while you’re watching TV or listening to music, and instead of your mind wandering, you can be focused on what you’re doing. Baking is just something I happened to discover helps when I’m worrying about something or feeling anxious. I’m busy the whole time, reading the instructions, mixing the ingredients, washing up, decorating, whatever. It keeps my mind busy, I’m active and I’m being creative, and at the end of it I have something that I made myself! (and also something I can eat). No matter what it is that I decide to do, even if it’s not on this list – walking, listening to music, going to the movies – the most important thing that I do is I make the time. I’m currently in the middle of my final year with a huge amount of work to do, and it’s very easy for me to say ‘I don’t have them time for any of that’. However, the time I could have spent doing something for myself – even if I just took 10 minutes – would probably be spent sitting there worrying and stressing instead. Even if I do have things to do, I may as well use whatever spare time I have doing something for myself instead of creating more and more worries in my head. This list is just what I find helps, and maybe some of it is useful to you, maybe none of it is. Find what it is you enjoy doing, then find the time to do it.